Sometimes we love the work, but not the job. 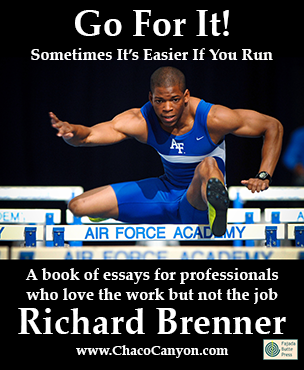 'Go For It' is an downloadable ebook that explores daily life at work, when the job can be a burden, but the work is a love. Sometimes This item is available in downloadable format only. Since it isn't shipped, be sure before you order that your shipping charges are 0.we love the work, but not the job. Or maybe just parts of the job. We don't want to leave, because the essence of the work, and it's potential for the future, are exactly what we want. But the conditions of employment are troubling. Bad boss, bad company, trouble with peers, long commute, unfair compensation, and on and on. Some days are better than others. People who ordered this item also ordered The Collected Issues of Point Lookout.Occasionally we have stretches of really great days. That's what keeps us coming back. The one-armed bandit of life gives us just enough encouragement to keep us playing. If this sounds a little familiar, then this book is for you. Go For It! Sometimes It's Easier If You Run explores daily life at work, when the job can be a burden, but the work is a love — or at least a fun playmate. It examines how we choose our own experiences from the menu life presents, and it will help you find some tasty treats. Most important, it shows you how commitment to what you're doing — whatever that is — makes life easier and more enjoyable. The book is organized as thirty short essays that at one time or another have been published as issues of my newsletter, Point Lookout. Each one is a quick read — perhaps five minutes or so. They're selected for a common theme — they're meant to get inside your head and your heart, so that after you read one, you'll put the book down and spend a day or so reflecting on it now and then. Or maybe reread it. In that time, it's my hope that you'll find new insight, and perhaps find something in the essay that you can put to use in your life to begin to change it for the better. The book is in electronic format — you can read or print it if you have Adobe Reader 6.0 or later. That makes it great for travelers (it weighs nothing) and it's a wonderful, uplifting gift. Go For It! Sometimes It's Easier If You Run is in Acrobat format, which gives you several advantages. You can print it, and read it like any book. Or in electronic form, you can use the search capability of Adobe Reader to find passages of special interest to you. If you load it onto your laptop, tablet, or other mobile device, you can read it anywhere — and it's weightless, too. 75 pages.